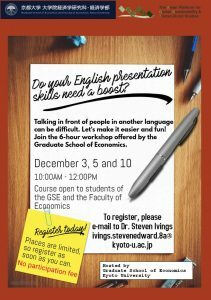 The Graduate School of Economics is pleased to announce the commencement of the call for entries for “English Brush-up Workshops”. Meeting Room (8F), Faculty of Law and Faculty of Economics East Bldg. 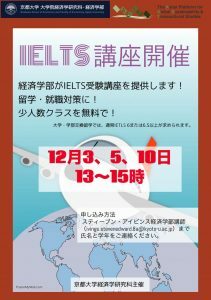 This workshop offers students with an opportunity to improve their presentation skills in English.